Sports Costs > How Much Is a Basketball? How Much Is a Basketball? When deciding on purchasing a basketball, you’re going to find there are a lot of choices available. It’s not as simple as purchasing the first basketball you see on the shelf. How much does a basketball cost? The cost of a basketball will depend on the type, the brand and the retailer you choose. 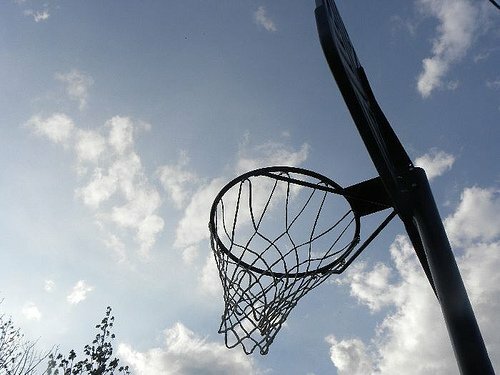 A simple rubber ball can cost as little as $7, while an official basketball can cost upwards of $100. If you are looking for an outdoor ball for your child, your best bet is a cheap rubber ball, such as the Voit Indoor/Outdoor rubber youth basketball. This type of ball can cost anywhere from as little as $7.50. If you are looking for a decent ball you can practice with indoors, a ball, such as the MacGregor X100 microfiber indoor ball, will do the trick. This type of ball will cost about $20 and $30. Indoor/outdoor composite basketballs can cost anywhere from $19 to $30. If you are in need of a game ball, the Spalding TF-1000 ZK or ZK Pro, for example, can retail for $40 to $50. A genuine leather basketball, such as the Spalding Official NBA Ball, will cost about $60 to $100. At Walmart, for example, the highest rated basketballs retail from as little as $7 for a MacGregor official sized ball to as much as $55 for a Wilson Evolution high school ball. Target, on the other hand, has similar prices, with a Spalding street ball retailing for $15 to as much as $35+ for a Spalding Premier 29.5-inch basketball. Basketballs will come in three sizes: five, six and seven. The sizes will depend on the age of the player. Size five basketballs are designed for children up to age 11. These balls will measure 27.5 inches in circumference and will weigh 18 ounces. Size six basketballs are for those between 12 to 16 years old. These balls will measure 28.5 inches in circumference and will weigh 20 ounces. Size seven basketballs are designed for those 17 and up. These balls will measure 29.5 inches in circumference and will weigh 22 ounces. This is the size used in the NBA. Basketballs are primarily divided into two categories: indoor and indoor/outdoor. Indoor balls will be made from a leather or composite, while an indoor/outdoor ball will be made from a durable composite or rubber. Balls that have an official NBA or high school association seal will cost more than one without the seal. An air pump is recommended for balls that don’t have a self-pump built within. A pump can start at $5. While it can easy to purchase a basketball online, you may want to head to a physical store and try it out in person. This is a great way to familiarize yourself with the basketball and see if that material is suitable for your play. A leather basketball will be soft to the touch and will offer a nice grip, while a composite basketball will simulate the feel of leather and can absorb moisture well. A rubber basketball will be the most durable out of all materials and can be the cheapest in terms of price. If you’re going to play outside, it’s best to purchase a ball made from a composite material since some balls aren’t designed to hit concrete. Check for coupons both online or consider purchasing coupons on eBay. Many sports stores have sales and promotions where you can save up to 40%+ on your purchase. If you are buying basketballs for a team, the best way to save money is to buy a set of basketballs (usually 12 or 15). Most companies sell each basketball cheaper if you are buying more than 10. Molten is a Japanese manufacturer that provides the official game balls for all FIBA championships. These balls will be marketed under the “Elite Competition” line and will be made of either leather or composite. Nike holds the contract to the Union of European Leagues of Basketball and is the maker of many recreation balls. Quite possibly the most popular basketball brand, Spalding has been manufacturing basketballs since 1876. This is the official manufacturer of the NBA, and the company produces a variety of basketballs. Known for its flagship ball, the SOLUTION, Wilson is the official basketball of the NCAA. Its basketballs are created from composite materials and is designed to hold moisture as the game is played.